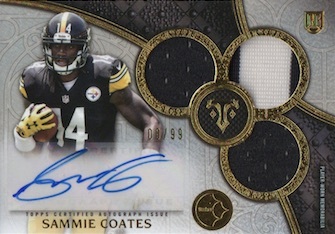 2015 Topps Triple Threads Football doesn't break much new ground for the brand. Memorabilia, autographs and big designs return. Each master box an autographed triple relic, a rookie autographed relic and at least two more relic cards. Once again, master boxes are divided into a pair of single-pack mini boxes. Not many are going to be busting 2015 Topps Triple Threads Football strictly for the base cards, but there is a set to build. The base set has 100 cards with a checklist of veterans and retired players. Numbered parallels include Purple, Emerald (#/199), Gold (#/99), Ruby (#/50), Sapphire (#/25), Printing Plates and Onyx (1/1). 2015 Topps Triple Threads Football has rookie cards as well. They're done in the form of Rookie Autographed Triple Relics that are numbered to 99. 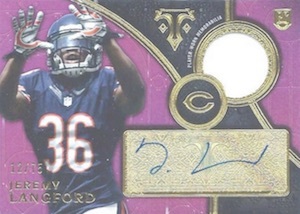 Among the standard parallels are Purple (#/70), Emerald (#/50), Gold (#/25), Ruby (#/15) and Sapphire Patch (#/10). Four different one-of-one Onyx parallels have patches as well as other kinds of gear like hats and gloves. Four Pigskin parallel versions, which are also one-of-ones, take a similar approach but add football pieces to the gear list. White Whale Printing Plate parallels all have patches. Signed triple relics carry over into the inserts as well. Triple Threads Auto Relics (#/18) mix veterans and rookies. Regular versions have one player. Triple Threads Auto Relics Trios have autographs and memorabilia from three different players. Both have multiple levels of parallels numbered to 9 or less. Moving up to bigger things, as in book cards, are Triple Threads Auto Relic Pairs (#/36). These have signatures and patches from two players. Jumbo Plus Auto Relics (#/3) have a massive swatch on one side of the card, and an autograph and two regular-sized swatches on the other. Parallels can include letters from jersey nameplates. 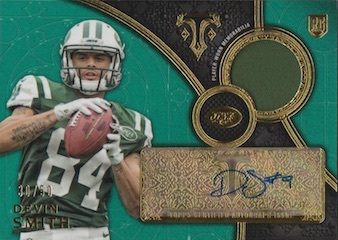 Every 2015 Topps Triple Threads Football master box includes an autographed relic. These come in the form of Rookie Autograph Relics (#/99). They're joined by Purple (#/75), Emerald (#/50), Gold (#/25), Sapphire (#/10) and Onyx (1/1). Collectors can also find some rare autographed inserts. Transparencies return, integrating rookie-signed pieces of acetate into the design. Topps 60th Gridiron Legends Autographs (#/25) come with a checklist of players from Topps' 60-year history of producing football cards. Hand-Stamped Autographs (#/10) return. The jumbo cards have both a rookie signature and an inked hand print. Triple Threads Relics (#/36) have three memorabilia pieces from current, past and first-year players. The many die-cut windows return. 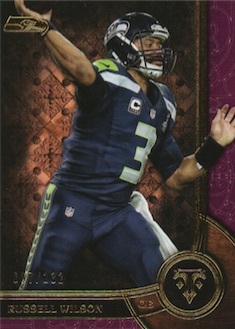 Triple Threads Relic Trios (#/36) take a similar approach but with three players instead of one. Both of these have five parallel versions numbered to 27 or less. One-of-one Triple Threads Shields have a jersey shield and two additional patch swatches. 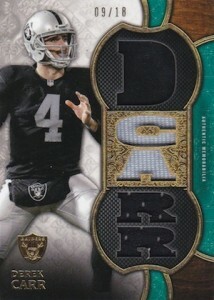 Jumbo Patch Combos (1/1) are book cards that have three big patches from three players. Rounding out 2015 Topps Triple Threads Football are Rookie Jumbo Relics (#/99), which have over-sized pieces of player-worn gear. Five parallels are numbered to 75 or less. 17 cards. Serial numbered #/36. 10 cards. Serial numbered #/3. 132 cards. Serial numbered #/36. 30 cards. Serial numbered #/36. 17 cards. Serial numbered #/10. Good: Some quality patch options, booklets are nice, all relics and autographs serial numbered, four hits per master box. Bad: Stickers as far as the eye can see, too many one-color jersey pieces, little innovation year after year. 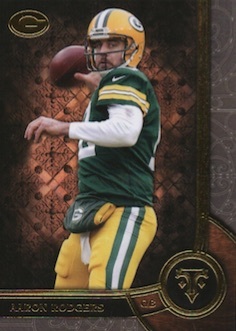 The Bottom Line: Topps Triple Threads Football is stuck in a rut and does not see any reason to change. While there are big hits, the product is a true gamble and it is hard to get behind a high-end format that relies heavily on stickers and event-worn jerseys. Always on the ornate side and featuring good stock, the base design is a swing and a miss for me this year. Brown, gray and black combine with gold foil to make a bizarre canvas and the dark scheme prevents the player image from standing out as much. The base parallels do not help things and it seems odd that they pick such random print runs like 232 for the Purple. In comparison to the base cards, I find the hit designs more appealing thanks to a lighter background. 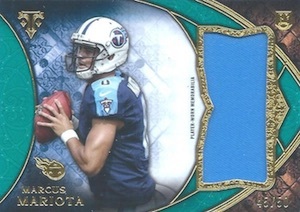 The primary rookie card design with the triple relic layout is the strongest of the bunch, in my opinion, but the sticker is disappointing as always. However, the rookie-but-not-the-main-rookie autographs feature many of the same subjects and showcase one relic piece and a sticker over gold foil. These do not work as well and can muddy the water about the official rookie cards from the set. Because it is TTT, there is also the standard mix of relics with various die-cut slogans and nicknames. I have never quite understood this and when you pull a card numbered to 27 that has three different relics, it would be nice if they were not all one-color jersey swatches. The 2015 Triple Threads checklist is like most of the products these days. 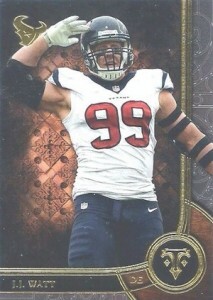 Heavy on rookies across the board, there are still key veterans to pull but they are very rare. One thing that is more unique to Triple Threads is the way the cards are allocated. Instead of one hit card numbered to 300 or 400, TTT goes with two to three versions of the same player in one subset that each have a lower print run and multiple parallels. While the lower amount gives the impression of rarity, it is really not that limited. The good thing is that you know exactly how many cards that each player has. The bad news is that that number is ultimately much higher than the 99 or less on each auto/relic card. Value versus cost is really out of whack in Triple Threads. A box that runs in the $150-175 range means that a lot has to come from the four hits and that is even more difficult given only two are signed and all signatures are stickers. Every product has their fans and I am sure some consider TTT Football a good value, but unless you hit a booklet or the handful of key rookie autographs, there is no way that most collectors will come close to matching the box price with their hits. At this price point, we are beyond just collecting to collect and there has to be a minimum acceptable level of value produced by each box. 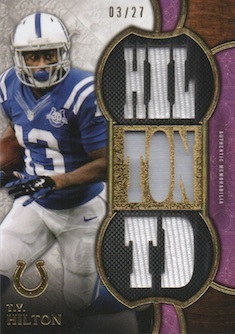 As the last Triple Threads Football edition for the foreseeable future, I can’t honestly say I will miss it. When a product becomes more about keeping the status quo than filling a hobby niche, it becomes harder to enjoy. I constantly found myself thinking, “I wish they had done this differently.” For me, Triple Threads took a step back in what could be their final offering and the overall fun factor suffered as a result. 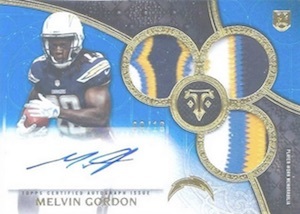 TODD GURLEY MELVIN GORDON AUTO 3 3 1 1 BOOK CARD 2015 TOPPS TRIPLE THREADS RARE! $175 for 2 relics and 2 autos. NOPE!!!!!!!!!!!!! Grabbed a box. Pulled a Jerry Rice Letter Plus Autograph Relic Booklet Card #’d 2/3. Also got a Sapphire Jay Ajayi Rookie Auto Relic #’d 3/10. Not bad at all!!!! Some boxes are great,some are not. It’s the same with all products. Some are loaded within the initial production run,some are loaded in the second production run. I absolutely love Triple Threads when it comes to baseball and decided to give football a try. I bought a box and got absolute crap for my hits. My parallels weren’t terrible but nothing better than a gold parallel. I then bought a spot in a divisional case break and received the NFC south. The case was absolutely horrible. Very few cards that seemed amazing and my cards were beyond disappointing. Lucky for me the cards I pulled were easily sold or traded because of some collectors love for high end mediocre products. At this point I feel like Topps is just phoning it in at this point. 5 Stars for your review Trey !! That’s exactly how I feel about this product. Purchased my first 2 boxes today. Pulled a Marcus Mariota RC Auto Relic, a TJ Yeldon RC Auto Triple Relic, Jarvis Landry Jersey Patch, and Kevin White Jersey Patch 3 of 3. Also pulled two no name autographs, but the rest of the lot made me happy enough. Several low # parallels included too <25. Would recommend and purchase again! I am a Breaker and Triple Threads is my favorite product to break. You get your best bang for your buck in this product, yea its not the cheapest but its not the most expensive by far. I have went through close to 50 cases and out of all of them only 1 case have I not been satisfied with, every other case has had atleast a White Whale or a 1/1 of some kind with some cases having multiple 1/1s. I am really gonna miss this next year!!! Got a white whale out of my first triple thread hobby box . Amari cooper rookie triple relic autograph 1/1 onyx card.